Jason Weisberger finally upgraded. Did seven years make much difference? The answer will probably not surprise you, but the details might. Rob described the original Kindle as "looking like wadded up cardboard" and I think he may be right. 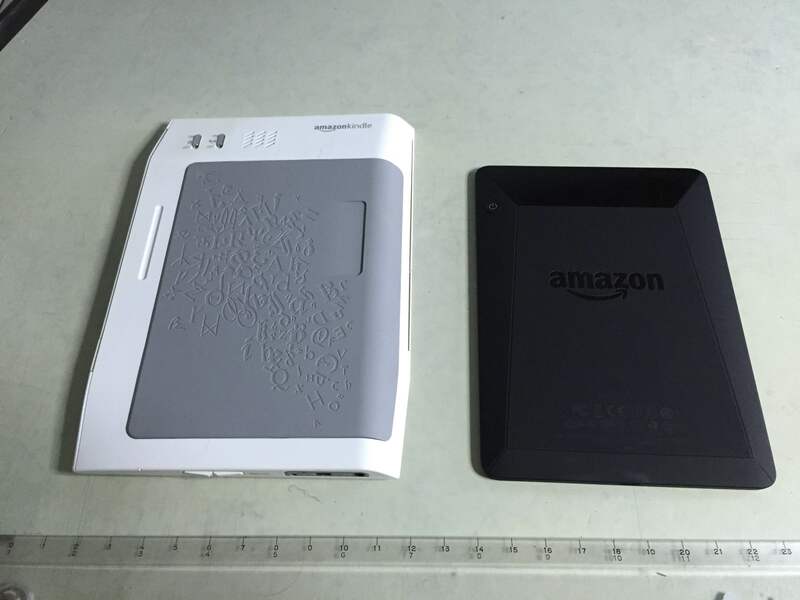 Before I'd even recharged the device and powered it on, I marveled at the insane shape Amazon felt was going to be most pleasing and book-like to the user. I remember being put off by the design when I first saw it, but I've actually missed it. OG Kindle did feel more like the bend of pages when holding a paperback sized book than any of the sterile, rounded Kindle's since. The Voyage backplate sports similar angling and ridging. It fits the hand in a similar manner, even the Amazon Origami case attempts to translate that tactile feel. I quite like it but actually still feel original Kindle maintains the edge over all other e-readers for actual book-in-hand-ness. Screen is simply no contest. The new Voyage is lightning quick, shows almost no ghosting and the matte glass front does stay unsmudged, far longer. The OG Kindle's screen is slow and ghosts a lot. The resolution would never be an issue, for me at the font sizes I read at, but seeing them next to each other its just unfair. In the world of controls, the firm clickity click of the original Kindle's 2001: A Space Odyssey buttons beat the hell out of these fake haptic buzzers in the Voyage. Essentially you keep pressure on a demarked spot long enough for Voyage to buzz. The feedback isn't a button click. It is something else, something meh. I prefer turning the Voyage's page with the simple touchscreen taps. Amazon has some branded language for tapping the touchscreen, I forgot it already. The UI on the Voyage is lightyears improved and the terrible scroll wheel of the Original Kindle is pure junk. The UI speed is so great on the Voyage it makes ol' Original damn near unusable for any functions beyond reading. Managing inventory or shopping in the Kindle Store is pure garbage on the OG. I can read 2 books in the time it takes to find and download 1 on the Original. "Up to a week" "Weeks on a single charge"
7.5" x 5.3" x 0.7" 6.4" x 4.5" x 0.3"
Reading is better on the Voyage. Unsurprisingly I like having a better screen, and the self adjusting front light is a dream. Voyage is a better reading device in all lighting conditions. The self-adjusting light is a dream, even nicer than the Paperwhite. The OG Kindle was a first gen device, this is the primary function of the product line at Amazon and they've made HUGE improvements. The Voyage is great in direct sun and lights out situations. Years back I retired the OG Kindle for an iPad with the Kindle app purely for the backlighting at night, it made reading outdoors impossible. The Original Kindle had a keyboard and the new Voyage doesn't. I never understood why I'd want to type on a reading device. The OG Kindle is a terrible web browser, so terrible I haven't even bothered to try on any subsequent model. 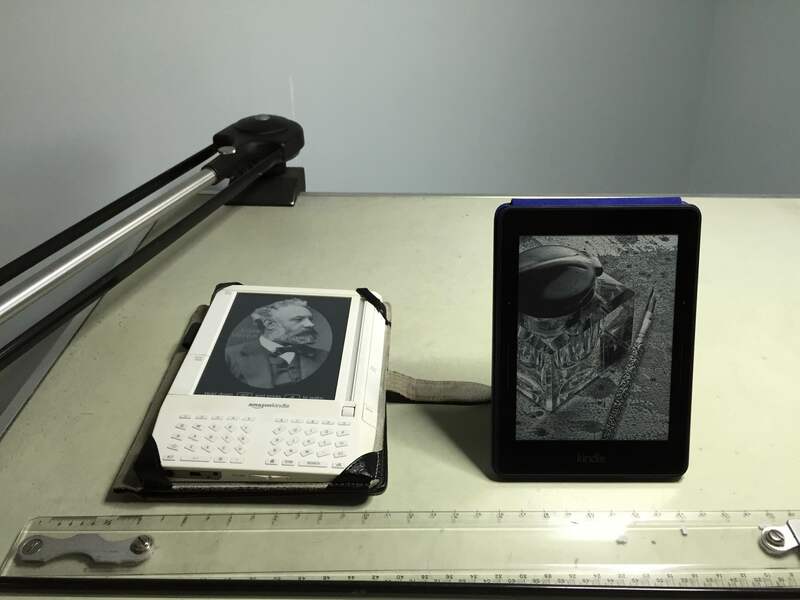 This is an e-reader, read books. The Origami cover for the Voyage is pretty good, thus far. The Origami stand part seems useless but it is a nice, form-fitting leather case that adds a lot to the tactile experience of reading on the Kindle for me. I have an aftermarket case on my OG Kindle that really does help it mimic a smaller, leather-bound book. If you are considering upgrading from the Original Kindle to the Voyage, I am gonna go way out on a limb here and highly recommend it.